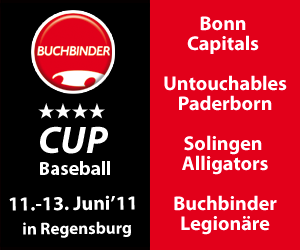 From June 11 to June 13 the Buchbinder Legionaere Regensburg have invited the Untouchables Paderborn, the Bonn Capitals and the Solingen Alligators to the 2nd edition of the Buchbinder Cup into the Armin-Wolf-Arena in Regensburg. Two games are scheduled each tournament day with the winning team taking home a big check from sponsor “Buchbinder Rent-a-Car”. Tickets are available on the official website of the 2011 Buchbinder Cup. We accept your submissions until Sunday, June 5 at 7pm CET. The winners will be announced on Monday, June 6. Good luck. Win Tickets for the 2011 Buchbinder Cup!